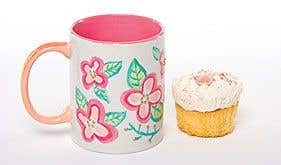 Mix your desired shade of dark pink and apply an even coat to the inside of a mug. 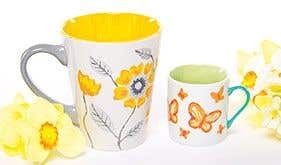 Take a thin tipped brush and, using the same shade, paint flower outlines all over the outside of the mug, using the picture as a guide. 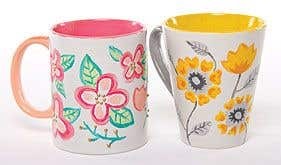 If you're not confident painting on freehand, try drawing on the outlines lightly in pencil first and painting over them - you could also use transfer paper to make it easier. Edge the flower outlines with a lighter pink, as shown. 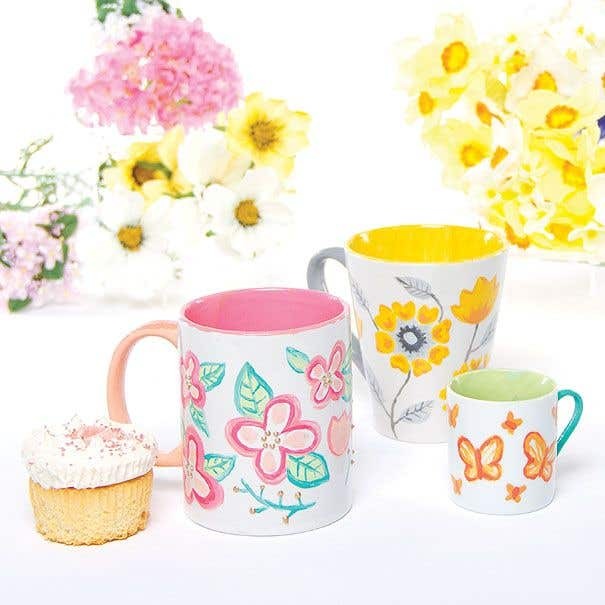 Using the same colour, fill in the flowers by dabbing the brush gently inside each petal. Paint green leaf outlines around the flowers, using the pictures as a guide. Mix a a lighter green and fill in the leaves. Leave to dry, then add veins to the leaves with the darker green. Use a gold Pictixx Glitter Pen to add 3D spots to the flowers and stalks. Paint the handle light pink to finish. Make sure you mix up enough of your chosen shade for the whole design, as it can be hard to colour match exactly afterwards! Don't forget to avoid overloading the brush.